For this demo, I will be using the Brotherhood of Steel Distress Pulser from Fallout 4. I’m expecting the reader to have a basic understanding of Autodesk 3DS Max. (everything I’m doing is definitely beginner level!) I’m also assuming the reader has set up their Max for metric units of measure, but it should work fine if set to inches too. 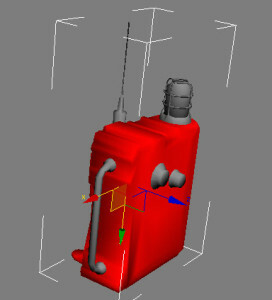 The model & maps were exported using the software called Noesisv, version 4172. It will load in Max in a tiny size, not the “real world” size you’re want to print it. For example, the body of this Distress Pulser comes in at about .9″ x 1.4″ x .55″. I want it sized up to about 11″ x 18.9″ x 7.3″. Model as exported from game. Go ahead & scale it to the final size first. That way it will be the right scale when you add details later. Using the scale in MAX just changes the model’s size in the scene, it does not actually adjust it’s “real” size. You can tell this by looking at the object properties. They’re the exact same dimensions before and after scaling. So after scaling, you’ll need to “fix” the scale of the piece. Note: it may not seem like a big deal, but it can cause confusion when you’re editing the model. So it’s better to fix the problem now. This resets the model, but leaves the Xform in the Modifier list. Xform in Modifer stack. 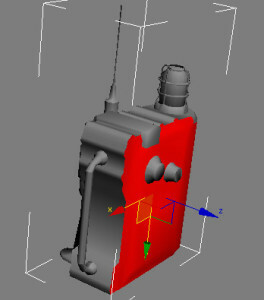 You can also see the Xform applied to the model. It’s the orange box around the Pulser Beacon. 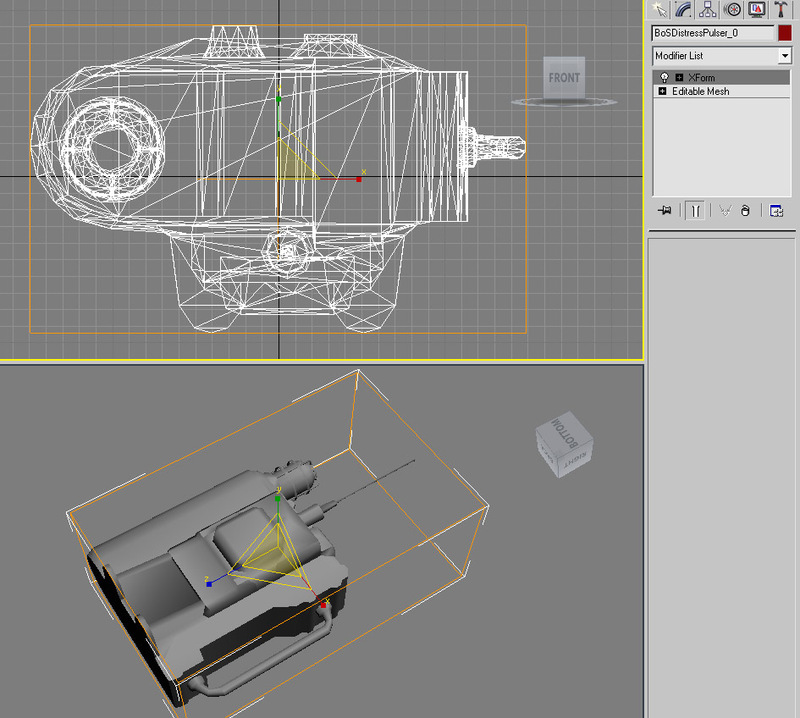 To neaten things up, I go ahead & collapse the Xform into the Editable Mesh. 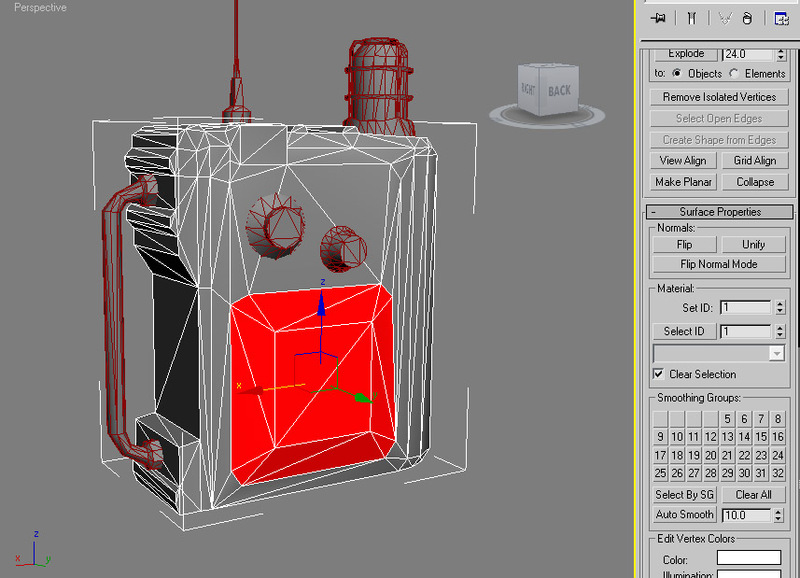 To do this, right click on the model and choose Convert to: > Convert to Editable Mesh. Now you can right click the model and choose Object Properties. You will see the model is reflects the new dimensions. The shell is broken up into multiple parts. Now that the model is scaled, we can merge the parts. For some reason, the models that come out of most games seem to be made up of separate patched of geometry. Even dials (simple cylinders) will sometimes be separated into 3-4 objects. This causes problems when creating shells, smoothing, etc. We’ll need to close up all those holes. The good thing is, there are overlapping vertices where the pieces meet. We can just weld the pieces back together. 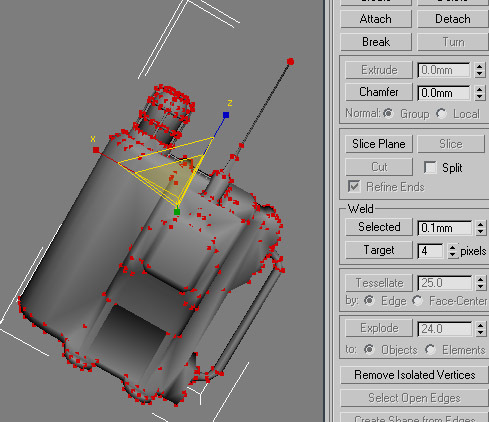 Select all vertices either by drag selecting or with Ctrl+A. 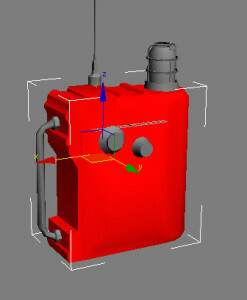 Click the Weld Selected button. The shell is now a single solid object. You’re going to want the individual pieces separated into their own objects. For weapons, that means the trigger, stock, barrel, bolt, scope, etc will all be their own pieces. 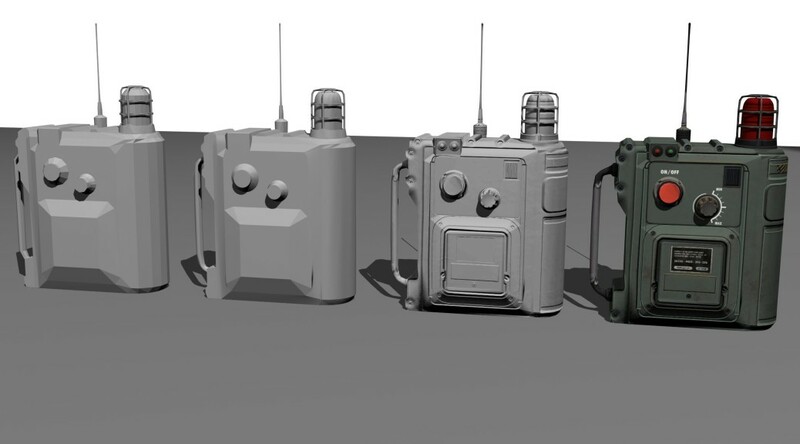 For radios, your antenna, knobs, handles, etc will each be their own pieces. This will be fairly easy because we’ve already welded the overlapping vertices. Choose to select by Element. You can now click on each individual part of the model and Detach them from the parent model. Now we’re going to smooth the model out. 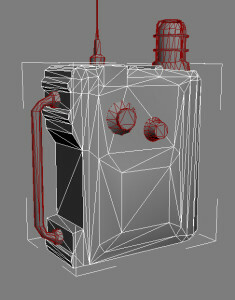 For this demo, I am starting with the body of the Distress Pulser. 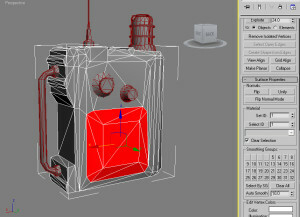 Set the Editable Mesh Selection to Face. Ctrl+A to select all faces. 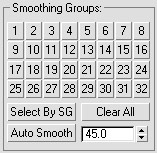 Now you can scroll to the bottom of the Editable Mesh modifier to the Smoothing Groups section. You’ll start your smoothing with the Auto Smooth Feature. 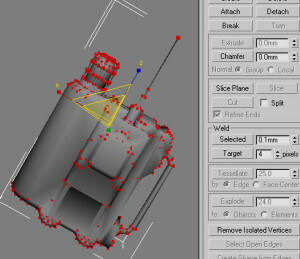 The # field beside the Auto Smooth Button is the angle between faces that Max will smooth. I usually end up with an auto smooth angle somewhere between 30 to 45. You’ll just want to try different values & see which one works best. We’ll fine tune individual faces later. The beveled panel on the front of the beacon has been lost due to smoothing. You can see the panel on the front of the Beacon above has been lost due to over smoothing. The easiest way to fix this is to select the panel faces, and auto smooth with a much lower angle setting. Panel faces selected and auto smoothed to 10. 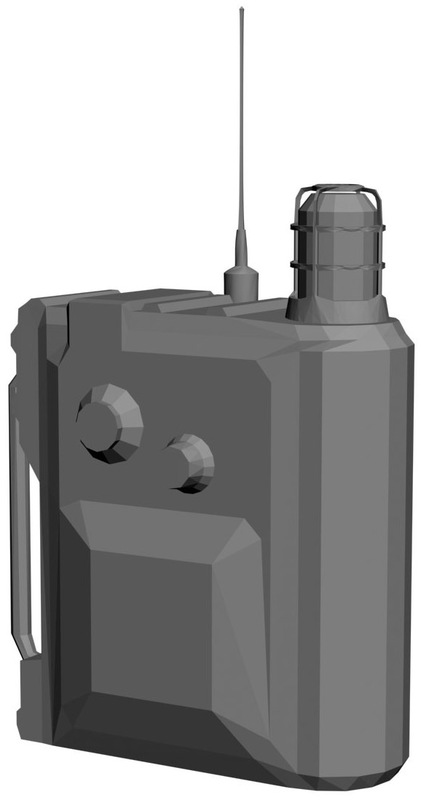 The front faceted panel will now show up in the smoothed model. Once you’ve got it smoothed close to how you like it, you can apply the Mesh Smooth Modifier to the model. 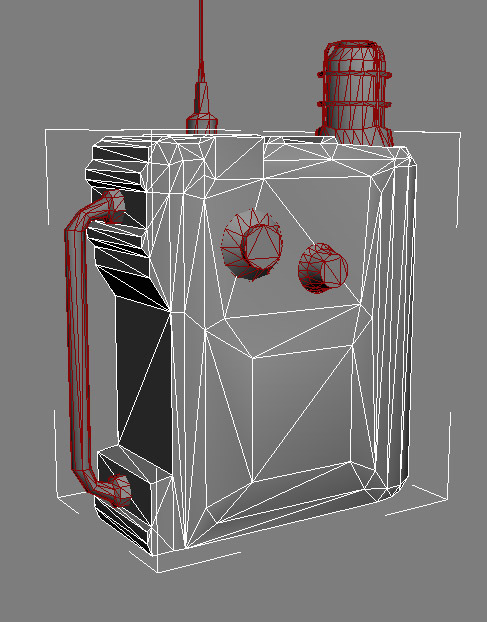 If it doesn’t look quite right, don’t worry, leave the Mesh Smooth modifer there. You can turn it off (lightbulb next to it in the Modifier stack), and then go back to the Editable Mesh to adjust your smoothing groups. Then turn the Mesh Smooth back on to see if you fixed the issue. Once you’re happy with how the shell looks, you can move on to smoothing the other pieces. 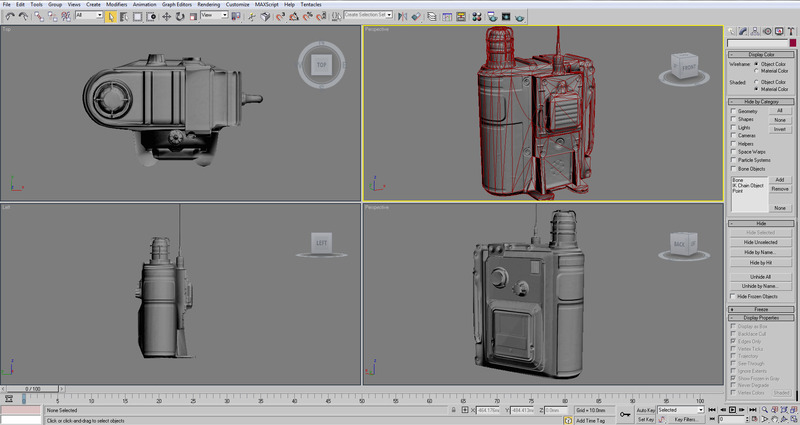 Below you will see the Brotherhood of Steel Distress Pulser ready for detailing. The geometry has all been smoothed, and I’ve applied a texture map that show the normal mapping (displacement map). This will allow make it easy to precisely recreate the details of the prop. Smoothed model with Normal Map texture applied. 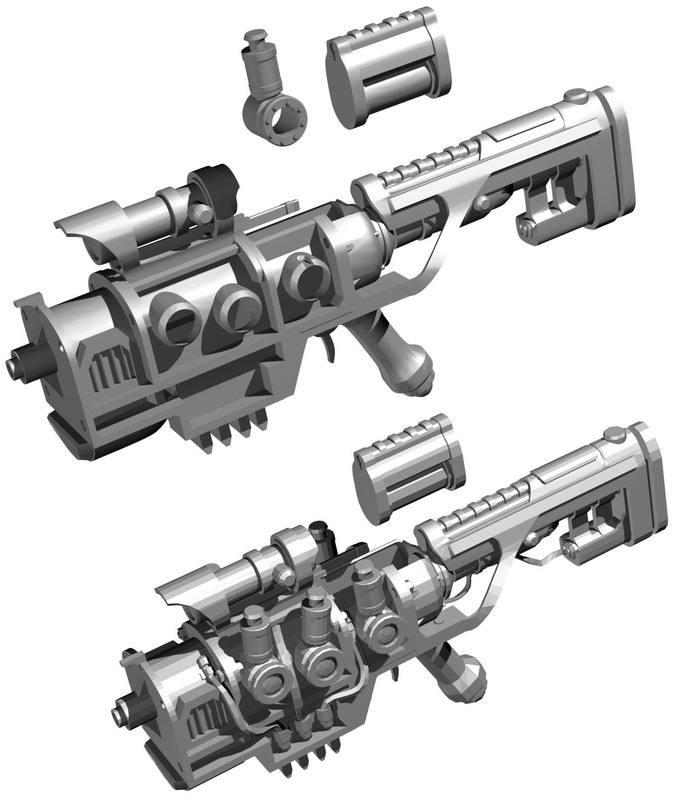 For a more complex example, here is the before/after initial smoothing for a Fallout 4 Plasma Rifle I’m working on. My smoothed model on top, the in-game model below. Please let me know if you have any questions or if I’ve skipped any steps.